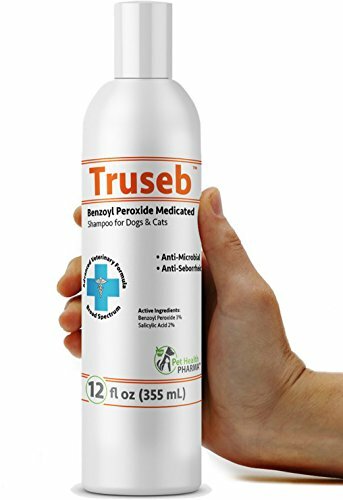 Truseb Benzoyl Peroxide Shampoo is a powerful cleansing and degreasing shampoo for the relief of scaling and itching associated with skin infection, seborrhea disorders, and follicular plugging on dogs, cats, and horses. The combination of benzoyl peroxide and salicylic acid allows for degreasing, follicular flushing, and enhanced keratolytic and keratoplastic activity. The combination also has antiseptic (antibacterial and antifungal) properties. Dermabenz-3 is formulated in a citrus scented soap-free, lathering shampoo base with skin moisturizers for gentle cleaning and deodorizing, while effectively removing scales and oils from the coat. ✅Active Ingredients: ❤️ Benzoyl Peroxide 3%, Salicylic Acid 2%. ✅Precautions: For topical use in dogs, cats, and horses. Avoid contact with the eyes or mucous membranes. If contact occurs, rinse thoroughly with water and consult a veterinarian. MAY BLEACH COLORED FABRICS. ✅Cautions: If undue skin irritation develops or increases, discontinue use and consult a veterinarian. ✅Storage: Store at controlled room temperature. Manufactured in USA,NASC Inspected Laboratory and FDA approved facility. ❤️ TOP RATED PRODUCT SHAMPOO - Truseb is Advanced Veterinary formula with Broad Spectrum to treat wide range of skin related problems. If you include Truseb in your weekly grooming routine, and after water activities, you will help keep your dog's ears safe and healthy. ❤️ MADE IN THE U.S.A. in Federally Regulated Manufacturing facilities, NASC inspected laboratory so you can trust the quality of ourpet skin care products to Ensure Quality and Safety. If you have any questions about this product by Pet Health Pharma, contact us by completing and submitting the form below. If you are looking for a specif part number, please include it with your message.